Vinyl gets its groove back! The tables are turning. Well to be more specific, the turntable is turning and with it the revival of vinyl music. The past couple of years have seen the resurgence of LP music and that is probably thanks to the rise in hipster numbers in South Africa. To be retro, different and not mainstream is almost the official hipster motto and listen to music old school style definitely fits this mould. I am not exactly an audiophile or music fanatic but I do enjoy good music from a wide variety of styles and genres. 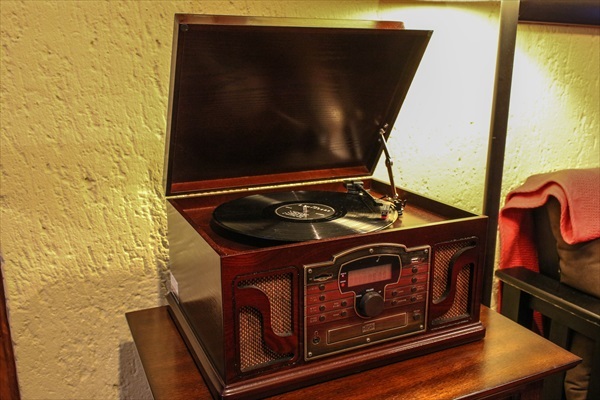 So it happened that about two years ago, whilst window shopping for anything weird in the antique shops of Parys (Free State), I came across my Crosley Troubadour turntable. We entered the shop and the soft lyrics of “Let it be” from The Beatles filled the quaint antique hideaway. 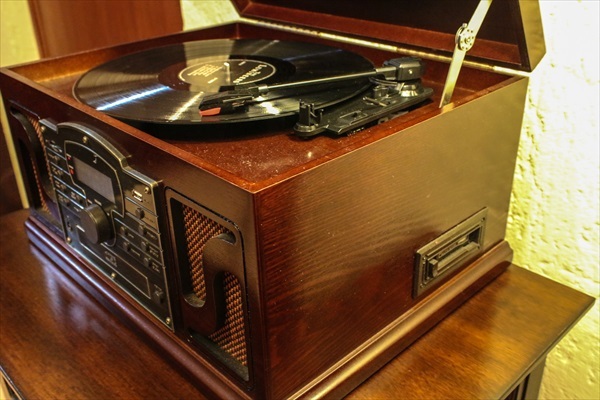 I followed the raspy, scratching sound which reminded me of many a classical movie I have seen in the past and it led me to a wooden turntable sitting on an old coffee table. 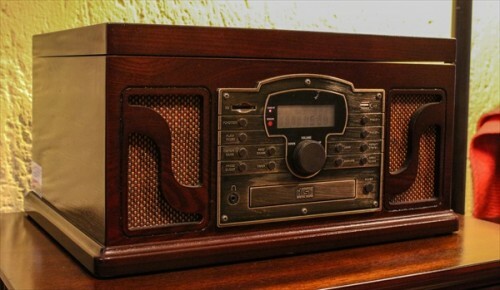 This thing just looked spectacular, a beautiful dark wood finish with old school styled wood inlays on the vintage speaker covers at the front. The black Beatles LP was lazily spinning under the flip up lid blaring “Mother Mary comes to me, speaking words of wisdom, let it be…” and I knew I just had to have this machine. The ever growing appeal of vinyl and turntable music is quite easy to understand. For the older generation it is a throwback to their past, the memories and nostalgia surrounding vinyl takes them back to summers past. 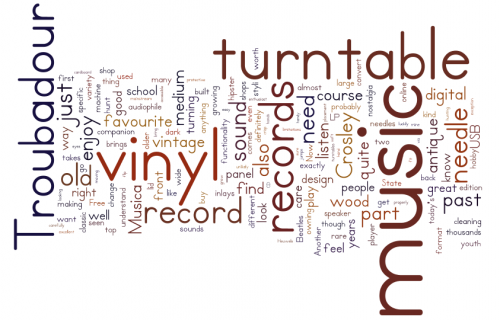 The vinyl record was the first mass produced music medium which enabled everyone to enjoy their favourite bands and musicians whenever they felt like it. But why is vinyl growing so popular with today’s youth? The teenagers and twenty-something’s of today grew up with the birth of digital music. Digital music is easily accessible (online) and modern technology lets you carry around thousands upon thousands of songs in your pocket. Why would today’s youth then want to listen to an outdated and cumbersome music medium? It is because listening to music on vinyl gets you involved, from the delicate placement of the needle at the right spot to turning over the record and of course cleaning and taking care of your LPs. You feel part of the experience, part of the experiment, part of the band. Another almost irresistible craving vinyl music brings is the treasure hunt. You constantly have your eyes open to old records in your auntie’s garage or on the dusty shelf somewhere in an old antique / pawn shop. You never know what kind of collector’s edition you might find. Like people who are into first edition books or vintage coins, really serious vinyl collectors hunt down those rare releases (and pay a premium for them) on sites such as eBay (Gumtree & OLX). Now that I have set the scene regarding the lure of vinyl culture let’s get back to the turntable. Even though I bought mine through an antique vendor in a little corner of the Free State, that doesn’t mean you have to go there to get your hands on one as well. Recently Musica have been climbing all over the turntable and record bandwagon and you can find the exact same model, the “Crosley Troubadour” at any large Musica store country wide. They also stock a variety of different smaller turntables. What makes the Troubadour unique though is the design, a vintage wood box design with flip-up lid that lends a vintage feel and would fit in with any earthy designed room, especially those focussed on dark woods. The curvy wood speaker inlays of my Troubadour rounds off an extremely good looking product. The front panel is finished in a brass plate look and has a built in LCD display. The buttons are understated circles with the exception of the volume rocker which is a large dial. When it comes to the functionality of the turntable the Troubadour has a secret weapon that goes far beyond the classy look and feel and that is its ability to play just about anything! The turntable accommodates just about any medium you can throw at it. The Troubadour can play cd’s, cassettes, digital music via USB, has a built in radio and of course the record turntable. This machine is your all-in-one music companion. What’s even more impressive is that you can convert your records onto digital format using a USB device to record your old records. The CD player can be found on the front panel and the USB port to the top right. The lower right hand panel of the turntable houses the familiar cassette player and of course the turntable sits on top. The turntable can play 33, 45 and 78 RPM records. The Troubadour also provides audio outputs should you want to hook it up to your existing system. Any vinyl enthusiast worth his salt will be able to tell you that owning records is quite a laborious hobby. Your records need to be carefully taken care off, this includes regular cleaning as well as making sure the records are stored properly (in a protective sleeve as well as cardboard covering). Your turntable also requires some service now and again. The part which takes the most strain is the styli needle. I received extra styli needles (the tip used to convert the music from the record to sound) when I purchased my Troubadour and they have come in handy to keep my record sound crisp and clear. It is usually quite tricky to know exactly when you need to change your turntable’s needle, but here are a few things to look out for. If you are playing a clean record and the needle jumps forward or the sound is overly scratchy and distorted you probably need a needle change. Another good way of identifying this is actually checking the needle visually. If the needle is worn down approaching the cartridge (needle housing) then you need to replace. You can buy these needles at Musica or Kalahari should you need them. Now I can go on about the design and functionality forever but I would be missing the most important part of owning a turntable, the ambiance. There is nothing as soothing as arriving at home on a Friday after a hectic week at work, putting on my favourite Billy Joel or Bob Dylan vinyl and relaxing to the moving sounds emanating from my Crosley Troubadour. Owning a turntable is more of a hobby than just a way to listen to music. Every step of the vinyl journey brings some kind of satisfaction. From hunting down or accidently discovering classic Dean Martin or Elvis records, to seeing your collection grow over the years. The care and love you put into maintaining your records and turntable and of course enjoying them with friends, family or on your own. Whilst many people will scoff at the re-emergence of vinyl, calling it a mere novelty fad, I know quite a few people who have embraced this old school medium. It has gone way past being a thing “only hipsters” do to more of an appreciation of music. Records don’t necessarily sound better on vinyl than digital but older music definitely does. The reason for that is an artist used to produce their records working with the limitations, specific sound and the advantages of vinyl. Musicians were making music custom made for an analog format. You don’t have to be an audiophile to understand the difference that classic records bring to music, you just have to enjoy it. If you don’t, luckily there exists countless other ways for you to enjoy your favourite tracks. 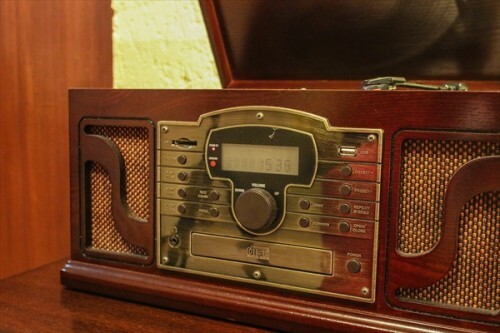 The Crosley Troubadour is worth every sent of the R 2999 you will spend at Musica, Kalahari or The Gadget Shop and opens up a whole new world of lost music and nostalgia. It is a great conversation piece and enables you to listen to some of the best forgotten music out there. You can also buy music from your favourite current artists such as Mumford & Sons to Adele and even some Afrikaans rock like Polisiekar and Die Heuwels Fantasties. If you do some research you will also find a few record shops (they are becoming less rare) and find an online retailer or two who imports and delivers. The Troubadour is an excellent all-round music companion. He looks great, sounds great and plays all the classics as they were meant to be heard. Editor’s Note: This is a post written by our resident gadget fundi, Jaco Van Der Walt.